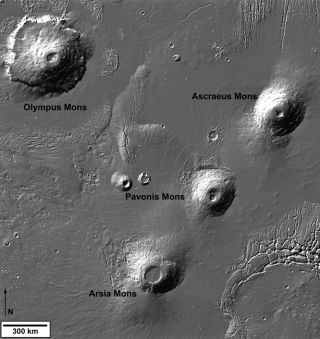 The three Tharsis volcanoes (bottom, right) straddle the region dominated by Olympus Mons (top left). Scientists think the volcanoes may not be extinct, but rather dormant and waiting for a hot plume of magma to travel beneath them. Marsappears to be a calm and desolate planet, but scientists now think somethingbig is brewing beneath its wind-swept surface. Newresearch on Hawaiian volcanoes, combined with satellite imageryof Mars, suggests that three Martian volcanoes may only be dormant—notextinct. Instead of Mars' crust moving over stationary magma "hotspots," as occurs on Earth, researchers think the plumes travel. "OnEarth, the Hawaiian islands were built from volcanoes that erupted as the Earth'scrust slid over a hot spot—a plume of rising magma," said Jacob Bleacher,a planetary scientist at Arizona State University and NASA's Goddard SpaceFlight Center in Greenbelt, Md. "Our research raises the possibility thatthe opposite happens on Mars; a plume might move beneath stationarycrust." Bleacher andhis colleagues' findings are detailed in a recent issue of the Journal ofGeophysical Research, Planets. Each of thevolcanoes, located in the Tharsis region of Mars, is about 186 miles (300kilometers) across. The largest volcano on Earth, Mauna Loa, is only 60 miles(97 kilometers) across. Although scientistshave never observed a volcanic Mars, recentimages from the European Space Agency's Mars Express missions suggest thevolcanoes there have been active within the past two million years and mightstill be. Also, the sparse impact craters near the three Tharsis volcanoes indicaterelatively recent eruptions. Lava flowsshow that these recent eruptions oozed from large cracks on the volcanoes'sides, occurring in a chain that meandered northeast. "Wethought we could take what we learned about lava flow features on Hawaiianvolcanoes and apply it to Martianvolcanoes to reveal their history," Bleacher said. But until recently,images of Mars weren't detailed enough to make a good comparison, he noted. Armed withnew images from NASA's Mars Odyssey and Mars Global Surveyor orbiters, as wellas the ESA's Mars Express, the team saw that the three volcanoes were similarin formation. However, each had recently erupted in distinct ways that allowed thescientists to determine the ages of the eruptions. During the volcanicactivity, lava oozed from cracks in the volcanoes' sides and formed "lavaaprons;" the smoother the apron, scientists determined, the older theeruption. Lava apronson the northern-most volcano, Ascraeus Mons, are the youngest, Bleacher said, whilethe southern-most volcano, Arsia Mons, has the oldest. Like the Hawaiianvolcanoes, the findings show that the volcanoes were fed by a common sourceof magma—but one that was on the move. There's analternative explanation for the chain of activity. Scientists postulate thatthe plume of magma could have spread out once it impacted the crust from below,like smoke hitting a ceiling. "Ourevidence doesn't favor either scenario," Bleacher said, "but one wayto explain the trends we see is for a plume to move under the stationaryMartian crust." If true, the traveling plume of magma could pass beneathdormant Martian volcanoes and stir them from sleep.